Presidential candidate of the People’s Democratic Party (PDP), Alhaji Atiku Abubakar, was received by an unprecedented crowd, yesterday, when his campaign train berthed in the ancient city of Kano. 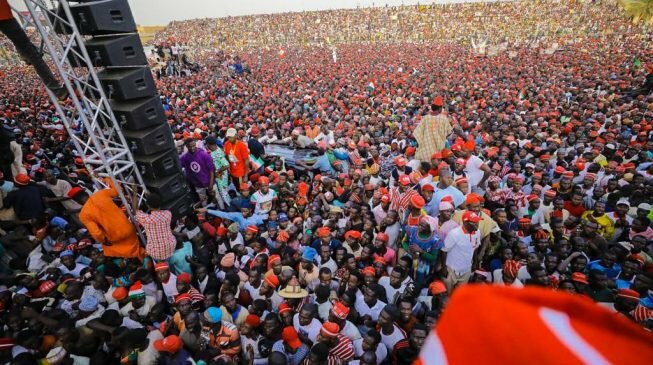 The PDP candidate figuratively locked down Kano as the crowd lined the streets from the airport to Sani Abacha Stadium, where the presidential rally held. Before going to stadium, Atiku visited the tomb of the great talakawa politician, Mallam Aminu Kano, for prayers, from where he paid a courtesy call on the Emir of Kano, Muhammadu Sanusi II. At the tomb of the late selfless politicians called Mambayya House, now Centre for Democratic Studies of the Bayero University, Kano, a wall collapsed as the crowd surged to get a glimpse of Atiku. Hero of the Kwankwasiyya group and the former governor of the state, Dr. Rabiu Kwakwaso, led the pack of other leaders, including Atiku, National Chairman of the party, Prince Uche Secondus, the vice presidential candidate, Peter Obi and Senate President and the Director General of the campaign, Dr. Bukola Saraki, to praise the crowd and pronounced APC dead in Kano. At the palace, Atiku told the emir that he was in the palace with his team to seek his blessing before going to address his subject for votes. The emir urged politicians to play by the rules and ensure free, fair and credible elections. At the presidential campaign rally, which took place at Sani Abacha Stadium, Kofar Mata, Atiku pledged to revive the commercial and agricultural fortunes of the state. According to Atiku, who arrived the stadium with his team in an open luxury bus, Kano is known all over for commerce and agriculture, regretting that the state has witnessed sharp decline in these areas since the coming of the Buhari administration. Atiku, dressed in the red and white Kwankwassiyya attire, also promised to improve hajj operations while tasking the crowd to vote for the PDP; from top to bottom. He asked the people of the state to vote for Atiku . On his part, Kwankwaso urged his followers to vote for Atiku even as he reiterated that Kano belongs to Kwankwassiyya and no other political institution, person or groups. They were received by a huge crowd which waited till 6:00pm, for the arrival of the campaign train. Meanwhile, several party supporters slumped due to suffocation and fatigue while they waited for Atiku. They were eventually revived by medics.